"Where are the markers to be found ? "How many are still in place" ? This little website - WRA website - is a first guide to locate the markers. If You want to learn MORE about the markers, I still have a number of CD-Roms Sanny and I develloped in 2003-2004 ... The data has always been updated ! You can get them for FREE. 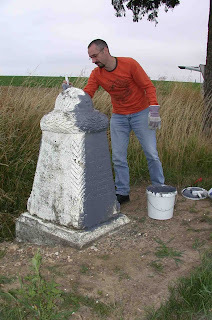 The picture was taken on July 21st, 2005, we were cleaning and painting the marker at la Ferté-Milon.